Here is the Fifth program that is to get the Drainage Pipes' Lengths in four ways. 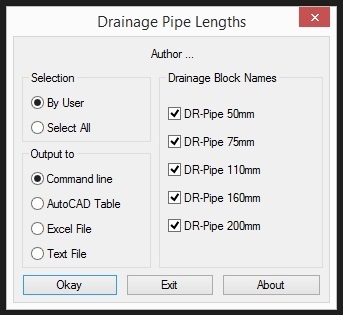 Easy to use and to figure it out and you must have used the Drainage Pipe program and have any of the Pipe blocks into your drawing before you try to use this program. Comment, Feedback and ideas are more than welcome. Your dialog looks fine, so I'm just leaving it as an idea to consider. IMO also it would be nice to create demos about pipe lengths & pipe dimensioning. Your new design of the dialog is a standard one but it looks busy and crowded. Isn't it? My dialog seems somehow a new design and user-friendly. I agree that demos needed but with such clear programs that do a specific thing, I guess it deserves a try from users. Many thanks for your participation & comments in this thread, its highly appreciated. You are right, but it was the only thing I could suggest. Atleast show some sample results if demos are hard to make (I expect that they are easy to use - just it would be nice to see the results). No problem Tharwat, your programs inspire me to write my own ones that help me in the architectural field. Demos are not really hard to make except when videos need too much time to describe the way the program goes / runs. your programs inspire me to write my own ones that help me in the architectural field.